Chess is a great game for kids of all ages to learn – it teaches patience, strategy skills, critical thinking and good sportsmanship. 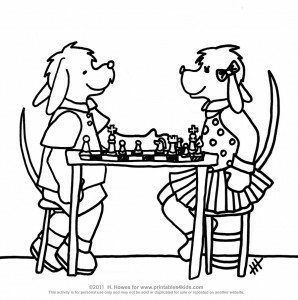 Here is a fun coloring page of our almost famous pups playing a game of chess. Click on the image to view and print full size. For a set of chess instructions and basic chess strategies that kids can understand, check out Family Games Treasure House.